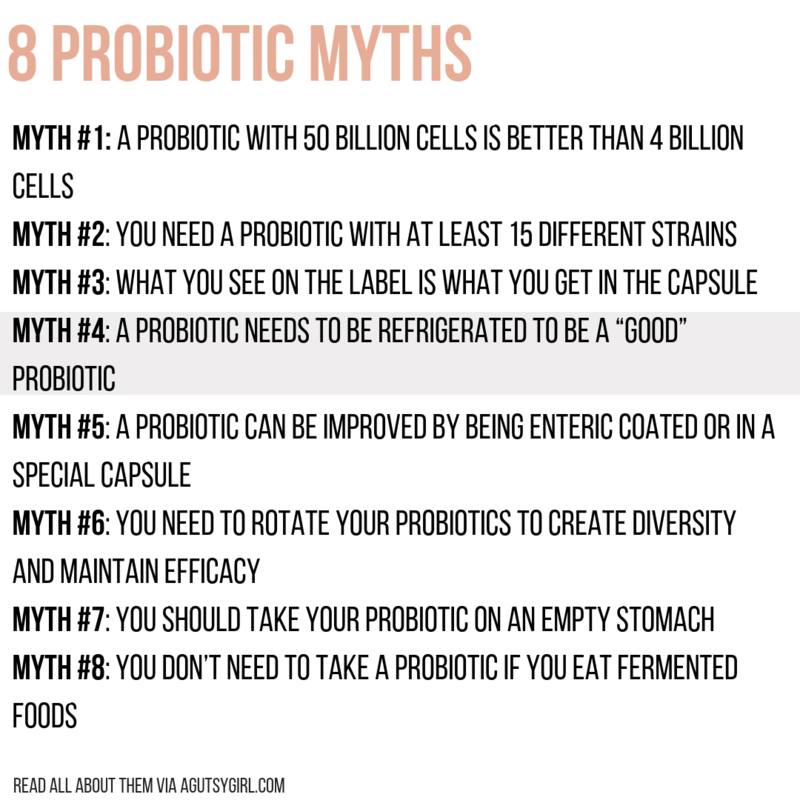 After giving you an overview of probiotic strains and species, I told you I’d share 8 probiotic myths. Many of the topics I’ll share today were follow-up questions from the post last week. 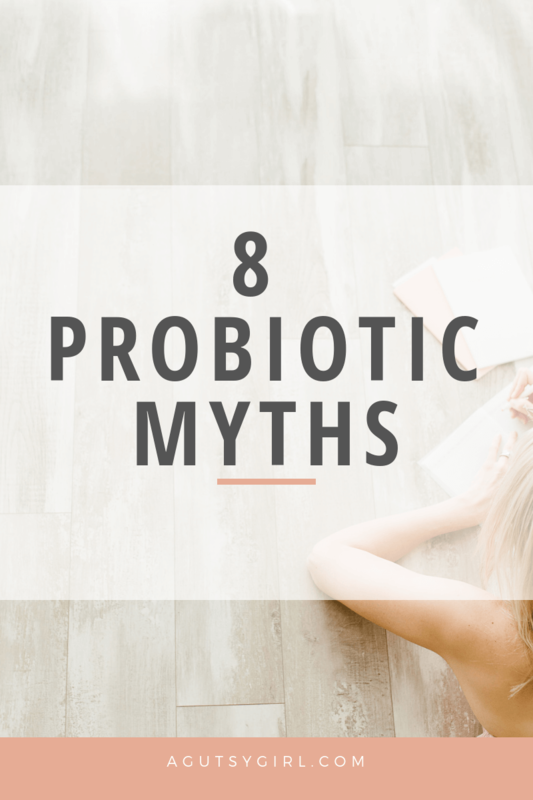 I didn’t make these 8 probiotic myths up. These have been carefully prepared by Kiran Krishnan (I talked all about him in the previous post, giving credentials). Because of Kiran, I made the switch (and am loving it!) to the Just Thrive Probiotic. FALSE. In microbiological terms, more is NOT always better. Having 50 billion CFUs in a probiotic is only helpful if you can confirm that 50 billion CFUs are surviving in the digestive tract. Unfortunately, survivability studies with some of the leading probiotics (as high as 250 billion CFUs) indicate that more than 99% of the strains cannot survive digestion. While Lactobacillus or Bifidobacter do reside in our gut, commercially produced strains are shockingly poor stomach survivors and gut colonizers. This explains why so many people find common probiotics ineffective. Look at your probiotic ingredient label. If the strains start with the word Bacillus, those are the hardy spore bacteria which have the ability to survive digestive acids and immediately begin healing your gut. Anything else indicates a fragile, non-spore strain. Absolutely false. Most probiotic studies are done with a single strain and there has never been a study that shows that more strains means better results. The quality of the strain is far more important than quantity. When a company creates a “kitchen sink” formulation with dozens of strains, they often have to use cheaper, lower quality strains to keep costs down. Furthermore, probiotic companies have no idea if these cocktails will be synergistic or if the bacteria will, instead, compete with one another, possibly producing a negative result for the consumer. You are better off using a product with 3-4 strains where the synergy of the formula has been verified than an untested product with 10-15-20 strains. Don’t be fooled by inflated labels that have dozens of stains. Instead, look for products that can reference clinical studies showing efficacy of their strains and synergy in their formulations. Not necessarily. A study at the University of California found that only 1 in 16 probiotics had labels that matched their contents for strains and potency. Think about that, 15 out of 16 bottles tested had different strains and/or potency than what was on the label. Do you really want to risk putting bacteria in your body that have not been tested for safety? Always ask a probiotic company for post-manufacture DNA verification proving that their ingredients and their potency match their label and have been characterized as safe. False. Refrigeration is actually a sign of a very weak probiotic. If a probiotic cannot survive at room temperature, how do you think it will survive in your 98-degree body, much less through your extremely acidic digestive tract? Short answer: it won’t. Ask for gastric survivability test results proving the probiotic arrives alive in the intestines and a gut model study showing that it colonizes. This is simply marketing. If your probiotic needs a special enteric coating, special capsule, seaweed coating or some other technology in order to survive digestion, then it will most likely be too weak to compete with the other 80 trillion bacteria already residing in your gut. A better approach is to find a probiotic that has been designed by nature to survive the gastric system, not one artificially engineered with no clinical testing that proves the technology works. False. The idea of rotating probiotics originated from the realization that many probiotics stop working after a month or two of use – the reason being that most probiotics are too weak to cause any lasting change in the gut. A truly effective probiotic, however, will not stop working over time. It’s not necessary to “surprise” the gut with a new probiotic cocktail every month when you work with the naturally hardy form of Bacillus. A true probiotic will continue to cleanse and heal your gut from daily assaults with every dose. Its effect multiplies; it does not go away. False. Many companies using delicate strains suggest taking their probiotics on an empty stomach simply because that is when bacteria-killing stomach acidity is lower. Even if they manage to survive digestive acidity, however, these fragile bacteria are unable to remain to colonize or effectively alter the gut microbiome population. In reality, an effective probiotic that successfully survives digestive juices will want to feed as soon as it arrives in the intestine, so the bacteria can immediately jump into action improving the microbiome. In that case taking your probiotic on a full, not empty, stomach would provide higher reproduction rates. Note: If you watch my Instagram Stories, you’ll see me adding the Just Thrive Probiotic to my children’s meals. They are 2, 3, and 5, and I simply open the capsule up and mix about 1/2 of a capsule into their food; twice per day. With the Just Thrive Probiotic you can do this because of its ability to survive heat. False. Although fermented foods can provide nutritious, predigested food to your intestinal bacteria, they don’t create lasting ecological change in the gut population and do not deliver living probiotic cells to the large intestine. If you can tolerate fermented foods, they are a great source of nutrients, assuming they aren’t loaded with sugar. They do not however, replace an effective, gastric surviving, DNA verified probiotic. When it comes to probiotics, what else do you want to know? I’m here to serve. And if you want to try the Just Thrive Probiotic, grab it HERE and at checkout enter ‘agutsygirl’ to save 15%. Can you recommend a probiotic ?